The museum is a historic site under Beijing Municipal protection. It lies in Xiannongtan on Dongjing Road, Xuanwu District, and is about 3 kilometers from Tiananmen Square. It is a theme museum that displays the history of ancient Chinese architecture. Its exhibits are divided into two parts–ancient architectures and exhibits on ancient architecture art. The first part consists of the ancient architecture complex of Xiannongtan. The building, also named Mountains and Rivers Shrine, was the place for the Ming and Qing emperors to offer sacrifices to such deities as Xiannong, Taisui, and the Gods of mountains and rivers. It was built in 1420, or the 18th year of Emperor Yongle's reign in the Ming Dynasty, when the emperor moved the capital from Nanjing to Beijing. Most of the remaining buildings in the complex were built in 1522, or the 1st year of Emperor Jiajing's reign in the Ming Dynasty. The second part shows in a systematic way the evolution of ancient Chinese architecture with exhibits kept in Taisui Hall and Yu Hall. The museum keeps a model of the old city of Beijing (the largest sand table model in China), the covert ceiling in Longfu Temple in Beijing (the only survival of its kind), and a model of Hall of Prayer for Good Harvest in Temple of Heaven. 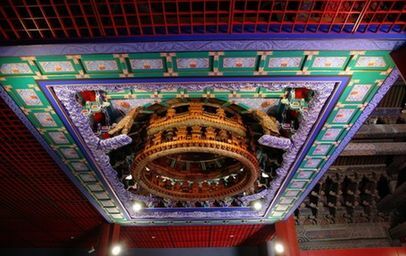 These exhibits show the great creativity of working people in China and the profundity of ancient Chinese architecture.